Just upgraded from the Magnepan MMG's. Great upgrade. I was looking to go with the 1.7i's but am happy to save the $1k with the T2's. The folder tweeter is super nice. Not as directional as my old Maggies. The Highs and mids are quite good. Maybe not quite as good as the pans in the mids. Overall sound quality when factoring in the mid bass etc. is a good upgrade. Highs are crisp and clean. Staging is great. The speakers easily disappear. The mid bass slam is a good integration with my HSU sub. Using all Emotiva for the front end. XPA-2 gen 1 amp and Emotiva DAC/Pre. Very musical and agreeable at moderate to high volumes. 100+ hours of burn in later. Midrange is leading the charge here. No complaints there. Tweeter is a bit sweeter. No hash or harshness. They play loud. Also very good at low volumes. Very good integration of drivers. Crossing the sub over at 50hz and 48db. 5db boost at 25-35hz seems to do the job. They need the sub for those low punching frequency but do well above 50 or so. Having a good old conversation with myself here.... No issues. Maybe others can get some insights into how these puppies sound since you cant go to your local HiFi shop and listen to them. Other observations. Coming from listening to Maggie MMG's I'm not wanting for quickness of response. These speakers are quick and tight. They sound like the are less efficient than the quoted 91-93db or so. My XPA-2 is used for the power it can produce. 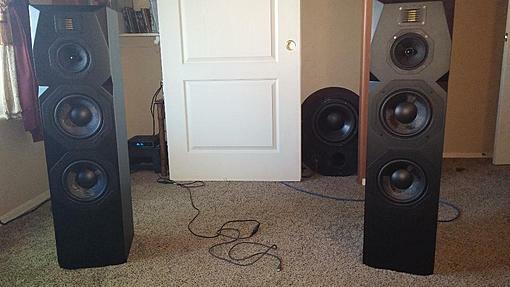 For sure the speakers are the limiting factory. Listening to Jethro Tull. I always found his recording to be very demanding of a full sounding system. The albums have been a bit light on the mid bass. This is the best Tull sound I have heard. Highs are delicious. Makes me want to push the volume, but, alas there are limits. Fortunate for my hearing! Last edited by earwaxxer; 06-28-2018 at 02:43 PM.